What does mom want this Mother's Day? Between search data and consumer surveys, Think with Google uncovered what today’s moms are really looking for in a new infographic of Mother’s Day gift trends. And the results are clear: Both millennial moms and older moms are looking for an experience. Dads and kids are responding accordingly. Our data reveals that Mother’s Day is the #1 day of the year for “spa” searches, and the #2 day for searches related to “reservations” (only behind Valentine’s Day). Searches for “flowers,” meanwhile, have dropped 20% over the last four years around Mother’s Day. However, one type of bouquet is actually gaining in popularity—the one you can eat. Search interest in “fruit baskets” grew nearly 20% from May 2013 to 2014. 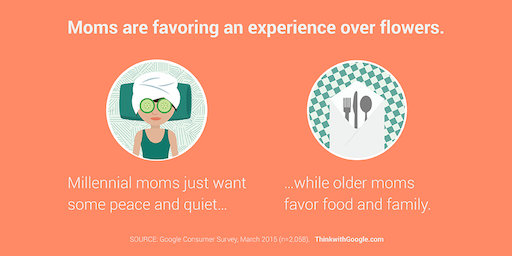 For more consumer trends, explore our new Mother’s Day infographic on Think with Google. And from all of us at Google, have a Happy Mother’s Day!